A wonderful, charming and relaxing location to take a break from life or to party it up. Walking distance is Lake Galena where you can rent a boat to cruise around, go fishing, or dock at random places and explore the forest. Fish (lots of it) from the peer or rent a boat, enjoy volleyball, soccer, basketball and tennis courts, as well as one of the best Golf courses in the world! Nearby is Galena town with its civil war-era charm, private wineries with wine tasting every day, local cheese makers, unique sauces, sweets, as well as antique stores. Fine selection of restaurants, from fancy French, Italian, to small town diners and burger joints (one literally called 'Burger Joint', its awesome!). About 20 minutes away is the Mississippi river and town of Dubuque. There you can find vegas-style casinos. This is a great destination for a family vacation, or just a friends getaway to nature. We can house up to 20 people in 2 houses that are next to each other. Lots of activities like hiking, fishing, golf in the freshest area, away from industry. Very quiet, pleasant, surrounded by forest and farms. Super relaxing environment. Great for large family or friend get together or a gateway for a couple. Perfect for parties, relaxation and even meditation. Lots of options for sports, including skiing, snowboarding, basketball, swimming. Comfort, luxury, and great hospitality! Our large family stayed for an extended time and we never had to worry about a thing! Very clean beautiful house, and the owner went out of her way to keep us comfortable and happy during our stay. So much to do in this historic town and at night before bed, a game of pool and the hot tub was a perfect way to end the day. Can't say enough about our time here! Beautiful home for a large group. We enjoyed our stay and found the space comfortable and homey. A very large home in a great location. We enjoyed our stay in the Galena Territory. The home was large enough for three families to have plenty of room and bathrooms. The kitchen was well stocked with all the necessities for cooking for 10 people. We enjoyed the hot tub and all the activities available at the owners center especially the outdoor pool. We would definitely consider staying at this home again. Thank You very much for your review! we welcome you to come and enjoy it next time! Thank You for your nice words. We are happy you had a nice vacation. Arrived early and had no problems getting in. Nice house. Had a minor issue with one of the toilets constantly flushing but the maintenance guy showed up right away and took care of it. Clean and convenient house . Almost everyone had a separate bathroom with shower. Jacuzzi was fun. Beautiful views and trails right next to the house. Checked out the association pool with the kids. Loved it! Nice fire place. Very relaxing drinking wine in front of the fire place when the kids went to bed. There is free sledding within the association. Many amenities near by. Thank You very much for your kind words. Hope to see you back soon. 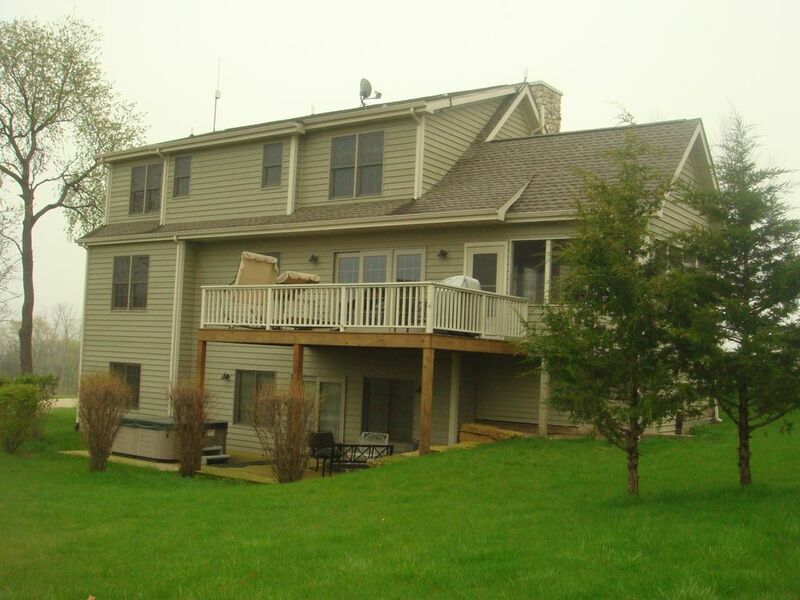 The home is part of the beatiful Galena Territory and is very close to the owner's club where we enjoyed swimming and tennis, and near the lake where we enjoyed boating. Thank You for your kind words. We are trying very hard to make your stay succesful. Welcome, to come back. Golf: One of the best Gold courses in the country! We increase rates for high holidays, such a Independence day, Memorial Day, Columbus Day, Xmas, New year, Thanksgiving . we give 1 night free for every three days of stay, except for High Holidays. The rate for the Holidays is $200 more. Additional discounts available for longer stays of a week or month. Please contact owner for more details.